Country star Clay Walker will be coming to Utah as part of the West Jordan Concert Series, produced by Merrill Osmond. Walker will play a one-night only concert at the West Jordan arena to help raise funds for the Olive Osmond Hearing Fund, which helps local hearing-impaired children. The concert, on May 12, is part of the “West Jordan Concert Series." The series will run from May to September (excluding July) and will showcase one performer each month. Walker will be joined by country singer Nathan Osmond. Walker has charted six No. 1 singles on the country charts, including "Dreaming with My Eyes Open," "If I Could Make a Living," "This Woman and This Man," and "Rumor Has It." 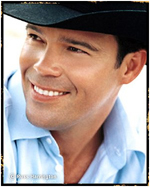 Tickets to the Clay Walker concert go on sale this Saturday (March 31) at 10 a.m. and will be available at any Smiths grocery store in Utah or on-line at www.smithstix.com or via the West Jordan Concert Series website www.WJconcerts.com.